ABU DHABI, Oct 21 2018 - Etihad Credit Insurance (ECI), the UAE Federal export credit company, and SACE, the Italian Export Credit Company (CDP Group), have signed a Memorandum of Understanding to enhance business opportunities between the UAE and Italy, as part of the 6th meeting of the UAE-Italy Joint Economic Committee held recently in Rome, Italy. 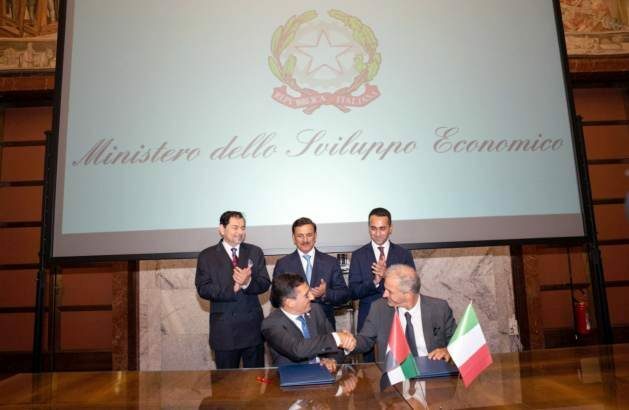 The signing of the MoU took place at the Ministry of Economic Development in Italy, in the presence of Sultan bin Saeed Al Mansouri, Minister of Economy, and Deputy Chairman of the Board of Directors at ECI; Luigi Di Maio, Italian Minister for Economic Development; and Saed Al Awadhi, Chief Executive Officer of Dubai Export and Development Corporation, and Board Member and Chairman of the Executive Committee at ECI. Under the MoU signed by Massimo Falcioni, CEO of ECI, and Alessandro Decio, CEO of SACE, the two national export credit companies have expressed commitment in strengthening the cooperation between UAE and Italy through the mutual sharing of expertise as well supporting the business relations of both countries. CEO of the Italian Export Credit Company said, “We are honored to cooperate with Etihad Credit Insurance, a key player in the UAE, being fully aware that stronger trade and investment ties between Italy and the UAE are crucial for the future of our respective economies. Our office in Dubai, with a €5-billion (AED21 billion) project pipeline, will play an active part in the Task Force confirming its role of ‘Italian bridge’ in the UAE”. The trade volumes between two countries have exceeded €6 billion (AED26 billion) in 2017. The UAE ranks number one in the MENA region for Italy’s agriculture and F&B exports while Italy’s imports from the UAE have also been growing. Other high-potential sectors for joint business exploration include steel and aluminum, ceramics, renewable energy, mechanical, waste management, industrial technologies, infrastructure and construction, jewelry and fashion, and F&B.